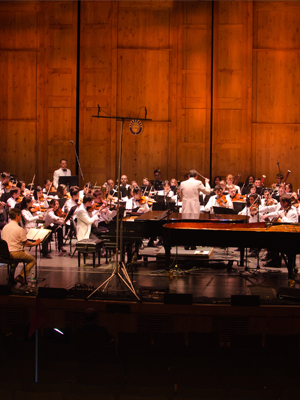 The National Repertory Orchestra performed on Show 309, recorded in Vail, CO, on July 9, 2015. The National Repertory Orchestra (NRO) is a preeminent intensive fellowship that equips young musicians for orchestral music careers while providing the highest-level of musical experience for all stakeholders. Their mission is to change lives through music! The NRO performs two full orchestral concerts each week in Breckenridge’s beautiful Riverwalk Center during the eight-weeks the orchestra is in residence. These performances also include several runout engagements in the area, including a concert at the Gerald R. Ford Amphitheater in Vail. The Bravo! Vail Valley Music Festival hosts summer residencies for the New York Philharmonic, Dallas Symphony, and Philadelphia Orchestras and members of these orchestras participate as master class clinicians with the NRO. In addition to working with Maestro Topilow, NRO members work with outstanding guest conductors, participate in seminars with inspiring clinicians, and perform in chamber ensembles with their peers through community engagement program. For more information, visit www.nromusic.com.